Update: There have been some changes to Meeting Burner since I originally posted this article. Here's a link to an updated post that includes a couple of other solutions. When considering hosting a meeting on the web, most people will at least look at the big boys; GoToMeeting and WebEx. They're alright, but not perfect in themselves. Over the years, I've tried a lot of different packages, but most were slow, with clunky interfaces. The people over at MeetingBurner.com are trying to come out with the next great meeting software and in my opinion, they've done a decent job out of the gate. There are other sites out there, but MeetingBurner packages everything up nicely. There are two features I really like that I feel will help provide a positive experience for the participants. The first thing is that you don't need to download anything, unless you're a presenter. In fact, you can set things up, so participants barely have to sign in too. The second thing is the ability to dial in using Skype. It can be a real pain to call numbers in different area codes, or different countries, so this takes the hassle out of it. The biggest reason for me to like this site is that it has everything bundled together, and it seems to be simpler and more intuitive than other sites I've used in the past. It's not perfect, and depending on who you are, you may still want to consider one of the big, paid versions, but compared to other free options, it's one you should keep an eye on. Participants can use Skype to call into the meetings, but the little button is so small, that you can barely see it. The audio on my initial test did have a few hiccups, but I was using WiFi and had a bunch of other windows open at the same time, so I'll need to go back and give it a fair test. I've tried MeetingBurner.com with a sample meeting and had a good experience overall, so the next step will be to use it for something bigger. In the interest of good blogging, I'm going use it for my Mega Productivity release (Mid February 2012), and I'll report back with my results. 1. 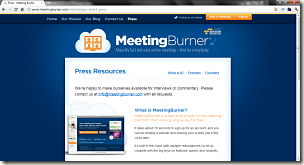 If you plan on hosting an online meeting in the next year, check out MeetingBurner.com. If you sign up now, they'll grandfather your current service level when they start charging. 2. Leave a comment and tell me about your experiences or alternatives. 3. Tweet, Like, Share, Bookmark, Etc., and let your friends know about this. The people over at Meeting Burner sent me a link to an interview of the founder John Rydell on Mashable. It's a cool video (even though the sound effects are a bit annoying) that will give you more in-depth knowledge of the product. Another very good alternative is: RHUB web conferencing server. MeetingBurner is one SLICK platform. Super easy to use. They have started charging but a) their prices are way better than the big dogs and b) there’s a forever free account if you run small meetings. Hi AJ. Thanks for the comment. I’ve been meaning to do an update to this post for a while. I’ve tested Meeting Burner a little more and I like it still. It’s true that now they’re charging, but the prices are definitely reasonable. Just tested it. If you need to share screen. You need to download. When will they start charging? For completely free but professional service, turbomeet.com is very nice. They support web conferencing and remote support functions. But there is a 50 min time out. Hi Susan. Thanks for your comment. When someone is just watching the presentation they don’t need to do anything. If they want the ability to share their screen, they will need to download a small applet. From what I understand, a pay for use model might kick into effect some time in the Spring or Summer, but that estimate is just from me trying to read through the lines. I could not agree MORE with your article and your review! MeetingBurner is MOST DEFINITELY the next “big dog” on the block. I’ve now hosted several meetings and not had one issue… customer service is prompt with answers and the interface is just simply slick and very Web 3.0! These guys continue to improve and are truly interested in our (their customer’s) input for improvements. I’m sticking with them… the performance far out performs the other meeting platforms including the two “biggies” mentioned in this article. Perfect for me… it’ll be perfect for you! (*unless large capacities are required–but they’re working on that TOO!) Go MeetingBurner–! Hi Theresa. Thanks for sharing your experience. It’s good to hear you’ve had some long-term success with Meeting Burner.